You can have simultaneous recording on internal high-speed SxS PRO+ memory cards and RAW 2K/4K recording on sleek AXSM memory cards using the optional bolt-on AXS-R5 recorder, designed specifically to attach seamlessly to the F55 and F5 cameras. There is also high speed shooting up to120 fps XAVC 2K/HD* internally and 120 fps RAW 2K onto the AXS-R5. *Expected as a future upgrade. ** Recording onto the optional AXS-R5 recorder. Lightweight modular design to maximize versatility in 2D and 3D The F5 is exceptionally small, light and modular, letting you build up the right configuration for each job or each shot. 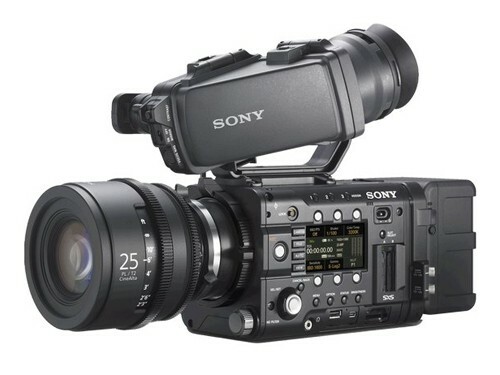 As well as the choice of formats and internal and external recording options, you can attached a variety of viewfinders, including the revolutionary optional DVF-EL100 OLED viewfinder, PL-mount, FZ-mount and still lenses, including second-generation Sony PL-mount lenses, and extra long-life Olivine Lithium Iron Phosphate batteries. The chassis is only slightly wider than a typical PL-mount prime lens, perfect for 3D rigs. An optional shoulder rig provides for hand-held and shoulder-mounted shooting. Out of the box, the F5 records 2K and HD in up to 59.94p in XAVC. With firmware update 2.0, already available, it will be able to record 4K RAW/24p and 2K RAW/120p/180p/240p to an AXS-R5 recorder, and 1080p 4:2:2 at up to 120fps internally in XAVC. With firmware update 3.0, due for release shortly, recording capability will increase to 4K RAW 1p to 60p externally, 2K RAW 1p to 240p externally, and 1080p 4:2:2 1fps to 180fps internally in XAVC. All RAW recording is 16-bit. Additional firmware upgrades will enable the SR Codec for 10-bit 4:4:4 at up to 440 Mbps. In addition to the AXS-R5 recorder, a digital interface on the F5 allows for a variety of optional viewfinders. DVF-EL100 is a 0.7" OLED viewfinder with 1280 x 720 resolution. DVF-L350 is a 3.5" LCD viewfinder with 960 x 540 resolution, and the eyepiece flips up for direct monitoring. DVF-L700 is a 7" LCD viewfinder with 1920 x 1080 resolution for monitoring Full HD pixel-for-pixel. Other modular components include the optional Sony shoulder rig, which features industry-standard rosettes on both sides for quick and easy attachment of third-party hand grips and other accessories. The F5 is designed to accommodate a wide range of lenses. With the PL-mount adaptor, you can take advantage of acclaimed cine optics from Angnieux, Canon, Carl Zeiss, Cooke, FUJIFILM, Leica and more. Slip off the supplied PL-mount adaptor to reveal the native FZ-mount with an 18mm flange focal distance. The FZ-mount provides an interface for native FZ lenses like Sony's SCL-Z18X140 auto focus servo zoom lens or a range of adaptors for still lenses, including Canon EF, Canon FD, Nikon F, Leica M and more. The ability to render a range of exposure values from deepest shadows to brightest highlights is a crucial test of any digital camera. The F5 is capable of an impressive 14 stops of exposure latitude, low-light sensitivity and low noise in the blacks. The digital sensor's dynamic range approaches that of traditional motion picture film. The F5 supports Sony's BP-FL75 battery pack, which uses Olivine Lithium Iron Phosphate instead of conventional Lithium Ion cathodes. The result is a substantial increase in charge-discharge cycles, compared to previous Sony batteries. The Olivine battery works with Sony's BC-L90 quick charger. The camera is also compatible with Sony's BP-GL95A, GL65A, L80S and L60S batteries, which use the BC-L70 and L160 chargers. Designed with significant input from cinematographers, the F5 features an intuitive interface for a range of controls. Instead of diving through menus, you get direct, one-touch access to key shooting parameters including frame rate, shutter speed, color temperature, ISO sensitivity and gamma. Assignable buttons mean that your favorite adjustments are always at your fingertips. The F5 offers numerous connections to suit your workflow, including four HD-SDI jacks, HDMI, USB, DC in connection, a removable XLR audio module and a removable time code/genlock module. The XLR inputs accept balanced analogue signals, provide 48-Volt phantom power and will accept four channels of AES/EBU digital audio with an expected firmware upgrade.